Many thanks to @KnitCave1 who alerted me to this, aren't virtual friends great? Please follow her, she's clearly a woman of discernment! 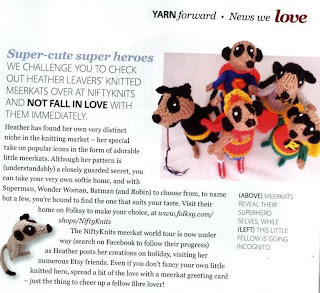 The meerkats look brilliant in the mag spread, what can I say, "power to the mighty meerkats!!" Yay! so glad to learn about this lovely achievement. Meerkats and Nifty rock! Well done! They SO deserved to be featured. That's so cool! Well done Heather! wow congrats! That is super! Well done - having gone global, I think the Meerkats will be cosmic next! Heather, that is so fabulous, and I'm so excited for you! Wow!!! Fantastic Heather-- Those little kats are everywhere!